I’ve got a lot of project ideas rattling around my head. Got even more of them in my notebook. One of the projects floating around in there for years that seemed pretty cool, but not urgent, was an automated thermal chamber for oscillator stability testing, roughly based on the one seen at the end of chapter 7 of Experimental Methods in RF Design. My interest was renewed a few months ago when Jennifer brought home some free Styrofoam containers from the vet’s office from Baxter’s annual checkup. They were nice and thick, as well as having straight interior walls, unlike the typical cheap beer cooler you find at the supermarket. Of course, Jennifer was thinking of using them for food, but naturally I had more nefarious purposes in mind for one of them. The real impetus to build the thermal chamber was the realization that it would be extremely helpful in characterizing the behavior of the Si5351A. Taking mental stock of what I had on hand, I realized that I already had almost everything I would need to do the job. So this last weekend, I decided to build the chamber and put it to use characterizing the Si5351A. In these tests, I used the Si5351A with a cheap garden-variety crystal: the ECS-250-8-30B-CKM. I don’t intend to do full write-up of the thermal chamber here (that will be coming in a separate post), but I will cover the basic design here briefly. The physical chamber is that veterinary Styrofoam cooler with rough dimensions of 25 x 30 x 30 cm. The device under test (DUT) sits in the bottom of the chamber. Over the top of that sits a shield constructed from pressboard and legs made from 2x2s which raises the shield to a height of about 9 cm from the floor of the container, and keeps the DUT from receiving much direct radiant heat. A 12 V PC cooling fan is mounted over a hole in the pressboard. There are also three other large holes on the outside edge of the pressboard, which allows the fan to circulate air between the upper and lower partitions of the chamber. The heating element is a 60 watt incandescent light bulb. A porcelain light socket is secured to the lid with a large cable tie, allowing the light to drop down into the top of the chamber. The weight of the porcelain light socket also helps to weight down the lid securely onto the container. On the electronics side, I chose an Arduino Uno clone (the Sparkfun Redboard) as the controller platform. Fortuitously, a little while ago I also happened to win a Seeed Studio Relay Shield, which worked perfectly in this application for switching the lightbulb and the fan. There was also a DS1821 One-Wire temperature sensor in my junkbox, which interfaced with the Redboard with a little bit of code I found online. An old two-conductor power cord and inline ATC fuse was used to provide power to the light bulb. Simple firmware was written for the Redboard that allows it to be commanded via the serial connection. The light and fan can be switched on or off via a single character command sent over the serial connection. Likewise, the temperature can be queried and sent to the PC via the serial connection. The shack PC ties everything together via a Python script. My Rigol DSA815-TG spectrum analyzer is used as the frequency counter, since I can control it remotely via USB with the Python usbtmc library. My control script reads the temperature and frequency on an interval (I’ve been using 15 or 30 second intervals) and has logic to control the light and fan based on the readings. I will post the code to GitHub when I write a full post about the chamber. Now that you know how the system works, let’s look at what I found with the Si5351A as the DUT. 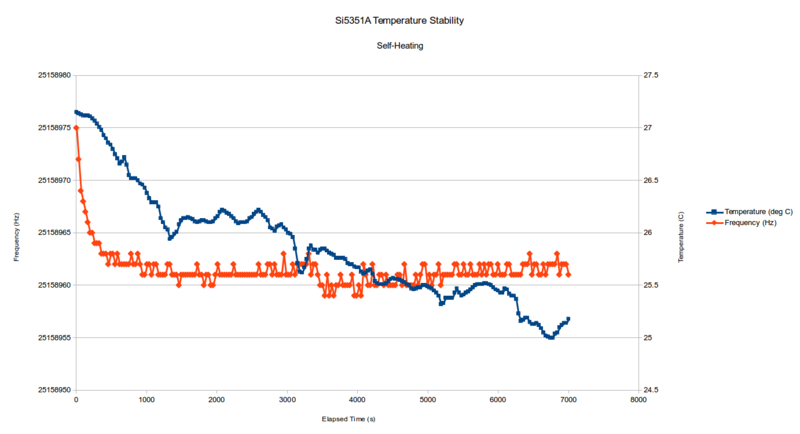 After doing some initial tweaking of the system to get it working the way I expected, on my first true run, I set up a simple temperature profile. 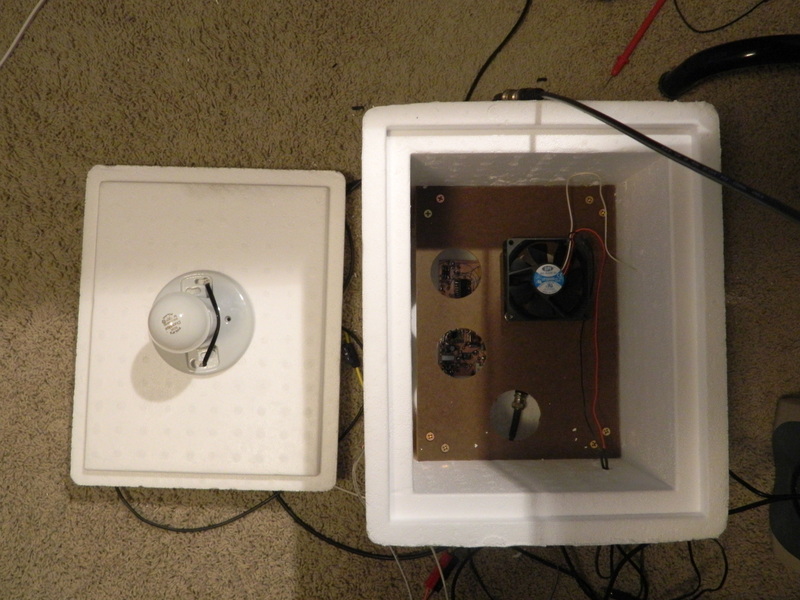 After a 4 minute idle period, the light and fan was commanded to turn on until the temperature reached 60C, then the light was turned off, and I cracked open the lid of the chamber a bit so that it could cool off relatively quickly. The most noticeable thing is the double-humped response in the frequency. You can see the typical frequency reduction as temperature increases, but then around 52C, the trend reverses! I’m not quite sure what to make of it. But I must say that total frequency excursion of about 70 Hz over 35 degrees of temperature change looks pretty nice to me. Next, Thomas LA3PNA suggested in the Etherkit IRC channel that I do a long run with no extra heating so I can get an idea of the warm-up drift and the long term stability of the oscillator in a temperature stable environment. That’s a very useful thing to know, so I reconfigured the Python control program to do that. As you can see from the plot below, after a small amount of drift in the first 10 minutes or so, the Si5351A is extremely stable. Those excursions that you see from the main trend line are only 1 Hz, so those may be due to the oscillator or to error in the frequency measurement, but either way I’d say that’s rock-solid. You can even notice that the temperature of the chamber was a bit high from the previous run and settled down slowly to ambient, but that had no noticeable effect on the stability. After that, the Python program was rewritten to ramp up temperature to 40C, then try to hold it there by toggling the light on and off if the temperature deviated more than +/- 1 degree. I wasn’t completely happy with the control loop in this one (I used 30 second intervals, but it should have been shorter) but the graph was still instructive. This time, the frequency response looks about how one would expect with this type of temperature profile. 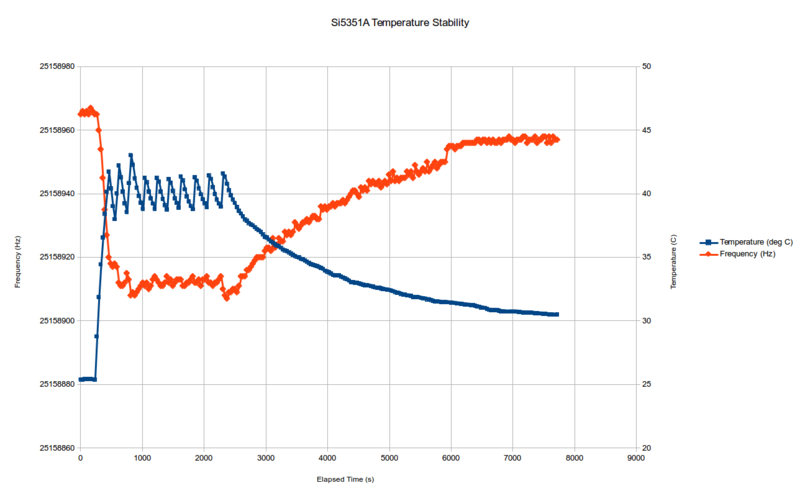 Finally, I again tweaked the control algorithm in order to tighten up the measurement interval to 20 seconds and the maximum temperature excursion to +/- 0.5 degrees. The hold temperature was set for 50C, which is close to where that odd inflection in the drift appears. You can see that the control at 50C is much better here. You will also notice that blip where the positive temperature coefficient appears to go negative. Still, it holds relatively stable at 50C. There is not a lot of data out on the internet to use for a comparison against this data. However, I believe it’s fair to say that the Si5351A looks pretty solid from a stability standpoint. It’s doubtful one will be operating a radio under such extreme temperature excursions in almost any case, but even so, <100 Hz of drift seems tolerable for almost any application where one is using a conversational operating mode. 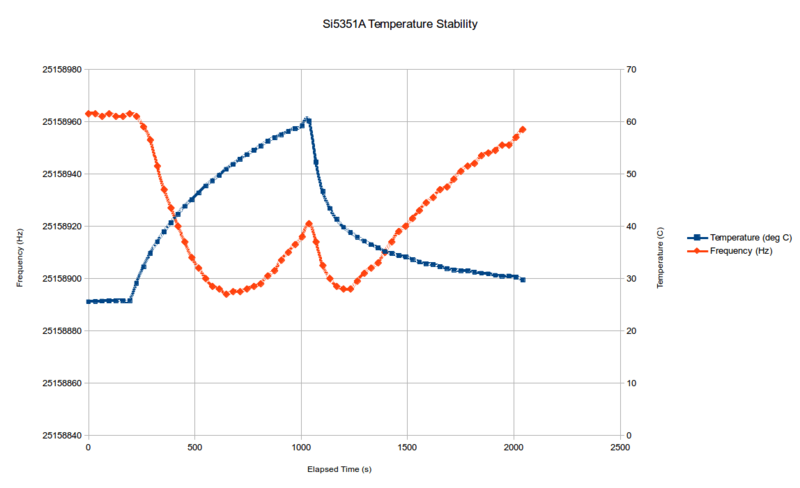 Of course there is still some more data which could be collected, such as performance at low temperatures, but from this initial investigation, I would say that things look very promising for the Si5351A. I finally received a small supply of the TCXO that I have been planning on using with the Si5351A for a while now: the FOX924B-25.000. 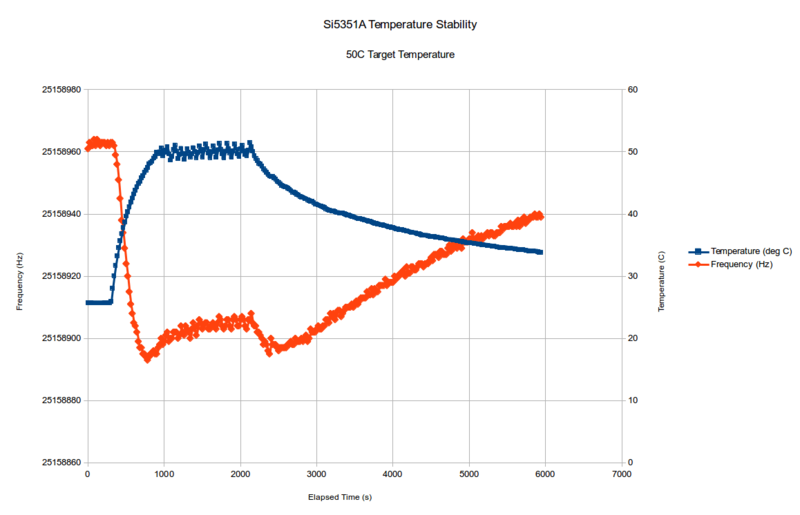 In the interest of comparing the performance of the TCXO against the standard crystal, I ran the same thermal chamber temperature profile as the last one above, although I removed the lid at the end of the 50C cycle to get a steeper cooldown gradient. As you can see, the TCXO stability is approximately an order of magnitude better than the crystal. The maximum frequency deviation is 9 Hz, although that occurs at the point where the lamp is turned off, so the frequency response is somewhat like the first derivative of the temperature curve. 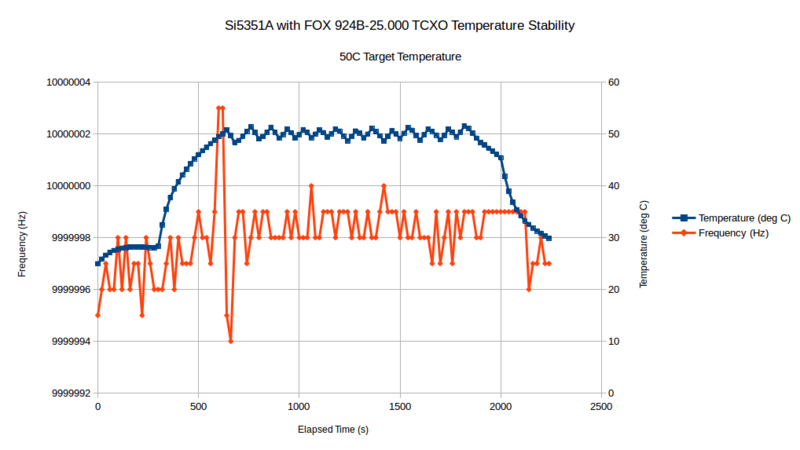 Once temperature is stabilized near 50C, the TCXO control loop does a great job maintaining frequency only a few Hz higher than the room temperature frequency. This TCXO should be suitable for nearly all but the most demanding applications. Certainly it would be excellent for WSPR/QRSS work and for portable outdoor ops like SOTA.